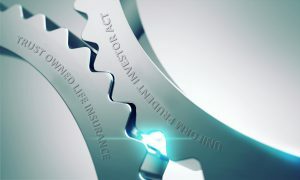 The major role of a life insurance trustee is the maximization of the value of the life insurance policy held in trust. There are times when the maximization of the trust may call for the replacement of the existing life insurance policy for one that is more appropriate and provides greater value to the heirs. A prudent approach is to consider as many of the issues as possible before making any decision that may affect the eventual outcome of the trust. There are special challenges associated with Trust-Owned Life Insurance especially regarding policy performance in the low interest and volatile climate we have weathered. The simple fact is that a good portion of life insurance policies sold in the last two decades have not performed as expected. At the same time lower mortality charges and more efficient product design have created a new generation of life insurance policies that can provide greater value for trust beneficiaries. For the professional trustee governed by The Uniform Prudent Investor Act (UPIA) there is a fiduciary process which requires that all assets, including life insurance, are deemed suitable for the specific trust goals and are reviewed periodically. It is critical in mitigating liability that the professional trustee have a process in place to review the trust assets and that the process be well documented and made a part of the trust file. There are a number of very valid reasons why an older policy should be exchanged for another policy. Changes in underwriting of the insured(s).Sometimes, the insureds have favorable changes to their health that might affect the cost structure of the policy. Underwriting opportunities. Specific underwriting programs which “shave” undesirable ratings off the original underwriting offers may become available. These may reduce the mortality costs within the policy. Loans. If the present policy has existing loans, the transfer of the policy values may have potential tax consequences. An outstanding loan is part of the policy’s cash value. Under certain circumstances you may exchange a contract with an outstanding loan for a “new” contract. This depends on many factors such as the size of the loan as compared to the policy’s cash value and whether or not the insurance company issuing the “new” contract will allow it. Not all insurance companies will allow this. The client should gain an understanding of this issue from a life insurance agent and also discuss this with a tax advisor. Taxes. Even if the policy does not have a loan, there could be tax consequences. Generally, if you terminate a life insurance policy, there will be taxes due on the gain in the policy, which is the difference between the surrender value and the cost basis (the amount of premium paid which includes any carry-over premiums from earlier contracts). We can help mitigate the tax consequences with the use of a 1035 Exchange. A 1035 Exchange allows the contract owner to exchange contracts while preserving the original policy’s tax basis and deferring recognition of gain for federal income tax purposes. Ownership. The owner and insured on the “new” contract must be the same as under the “old” contract. However, changes in ownership may occur after the exchange is completed. Two or more “old” contracts can be exchanged for one “new” contract. Multiple contracts can be exchanged for one contract as long as the insured, the beneficiary and the policy owner are the same. You cannot exchange a second-to-die policy for a single-life policy or vice versa. However, the IRS has provided guidance in two Private Letter Rulings which allowed the exchange from a second-to-die policy to a single life policy after the death of one of the insureds.